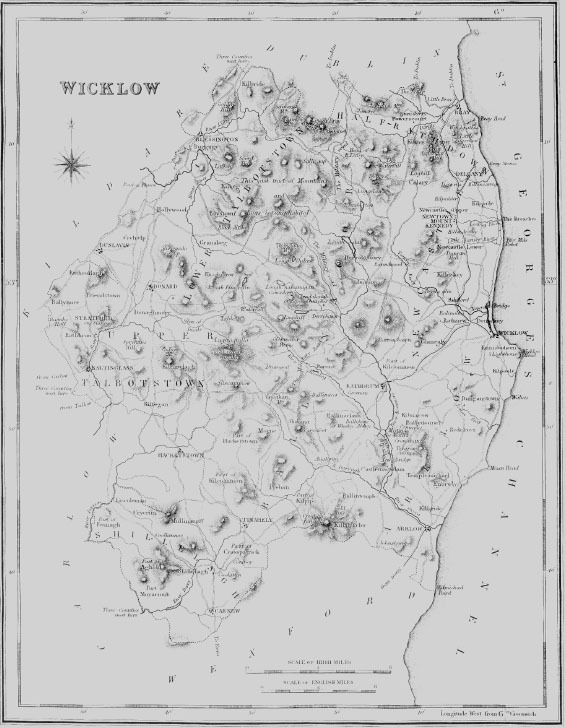 ENNISKERRY, a post-town, in the parish of POWERSCOURT, barony of RATHDOWN, county of WICKLOW, and province of LEINSTER, 3 miles (W. S. W.) from Bray, and 10 (S. by E.) from Dublin, on the road from Dublin, by Dundrum, to Roundwood ; containing 497 inhabitants. This place, which is of modern origin, and has risen chiefly under the auspices of the noble family of Wingfield, Viscounts Powerscourt, occupies a beautiful situation on the acclivity of a hill rising from the bank of a mountain river called the Kerry. It contains about 70 houses, most of which are tastefully built in the cottage style and inhabited by families of respectability ; and from its vicinity to the beautiful scenery of the Dargle, the Powerscourt demesne, the waterfall, the Scalp, and other objects of general attraction, is a favourite resort for strangers and visiters from Dublin, for whose accommodation two very comfortable hotels and lodging-houses have been fitted up. The air is extremely pure and mild, and the equability of its temperature is highly favourable to persons affected with pulmonary diseases ; a mail and a stage coach and jaunting cars ply daily between it and Dublin. The environs are very pleasing, and, exclusively of the seats and villas noticed under the head of Powerscourt, there are several handsome villas in the immediate vicinity of the village, of which the principal are Summer Hill, that of P. Flood, Esq. ; Sea View, occupied by the Rev. A. Wynne ; Enniskerry Lodge, of Capt. T. Mason, R.N. ; and Wingfield Terrace, of J. Gason, Esq., M.D. A constabulary police force is stationed here, and petty sessions are held on alternate Fridays. Near the bridge is a neat school-house, with apartments for a master and mis tress, erected by the late Lord Powerscourt ; it has lately merged into an infants' school, supported by the present lord, and part of the building is appropriated to the use of a lending library. A girls' school, a very neat building on the Scalp side of the Kerry, was erected by the late Lady Powerscourt, in 1828, and is also supported by his lordship. Here is a dispensary, and in 1828 a fever hospital was erected by subscription, towards which Lord Powerscourt contributed #200. Almshouses, for six aged and infirm women were built partly by the late Lord Powerscourt and the Rev. R. Daly, the rector of the parish. A district society has been established for selling clothing to the poor at reduced prices.-See POWERSCOURT. POWERSCOURT, a parish, in the barony of RATHDOWN, county of WICKLOW, and province of LEINSTER, 3 miles (W. S. W.) from Bray, on the road from Dublin, through the Scalp, to Roundwood ; containing, with the town of Enniskerry (which is separately described), 4375 inhabitants. This place, which in the ecclesiastical records is called Stagonil, and in other authorities Templebeacon, takes its present name from the De Ia Poer family, to whom it was conveyed by marriage with the daughter of Milo de Cogan, one of the followers of Strongbow, who built a castle here to protect his territories from the incursions of the mountain septs of the surrounding district. The castle was, in 1535, surprised and taken by the Byrnes and O'Tooles, but was soon recovered by the English amid subsequently granted by Hen. VIII. to a branch of the Talbot family, from whom it was taken, in 1556, by the Kavanaghs and garrisoned with 140 of that sept ; but after an obstinate resistance it was taken by Sir George Stanley, and the garrison were sent prisoners to Dublin, where 74 of them were executed. In 1609, Jas, I. granted the castle and all the lands of Fercullen, with the exception of 1000 acres of the parish, now belonging to the Earl of Rathdown, to Sir Richard Wingfield, ancestor of the present Lord Powerscourt, as a reward for his services in suppressing a rebellion in Ulster raised by Sir Cahir O'Dogherty and Sir Nial O'Donell, in 1608, of whom the former was killed in the field, and the latter made prisoner in his camp : the lands were soon afterwards erected into a manor, and in 1618 the proprietor was created Viscount Powerscourt. The parish, which is situated on the confines of the county of Dublin, and intersected by the Dargle river, comprises 20,800 statute acres, of which 7853 are fertile arable land, 5635 are of inferior quality, and 7312 are mountain. The surface is beautifully diversified, and richly embellished with handsome seats, highly cultivated demesnes, luxuriant plantations and wooded eminences, finely contrasting with the rude grandeur of rugged masses of rock rising majestically from the narrow glens, and the loftier elevation of the surrounding mountains. Powerscourt, the splendid seat of Viscount Powerscourt, is a spacious mansion of hewn granite with two fronts, one consisting of a centre with a portico supporting a pediment, in the tympanum of which are the family arms, and of two wings, each terminating in an obelisk supporting the crest ; the other front has at each extremity a circular tower, surmounted by a cupola and ogee dome. The interior contains many stately apartments, among which are a noble hall, 80 feet long and 40 feet wide, richly decorated ; a spacious ballroom of equal dimensions, with galleries on each side, supported on lofty fluted columns, and sumptuously embellished ; the floor is of chesnut wood highly polished and inlaid, and the whole displays much beauty of arrangement and elegance of decoration. In this room King Geo. IV. was entertained at dinner by the late Viscount ; the splendid chair of state provided for his use on that occasion is still preserved. There are some splendid paintings lately brought over by the present Viscount, and a handsome octagonal room entirely wainscoted with cedar. The demesne, to which the principal entrance is through a lofty and handsome gateway on Enniskerry hill, comprises 1250 acres, of which 500, constituting the home demesne, lie around the mansion, 550 in the deer-park, and the remainder on the north side of the Dargle, which belongs to his lordship. From the terrace in front of the mansion is a fine view down a romantic glen, enclosed by impending mountains, among which the two Sugar Loaves are conspicuous, and terminating with the rugged outline of Bray Head ; and in every part of the demesne, which is richly embellished with stately timber and flourishing plantations, the scenery is replete with beauty and grandeur. The Glen of the Waterfall, to which the approach is through the deer-park, is embosomed in mountains clothed almost to their summit with woods of oak ; emerging from these the cataract is seen in all its picturesque grandeur, precipitating its waters in an unbroken volume from a height of more than 300 feet, with scarcely any interruption from projecting crags, into a chasm at its base between lofty detached masses of rock. When not augmented by continued rains, the sheet of descending water is clear and transparent, and the face of the precipice is distinctly seen ; but after heavy falls of rain it descends with tumultuous violence, and the whiteness of the foam forms a striking contrast with the dark foliage of the surrounding woods. A slippery path beneath impending rocks leads to the summit of the precipice, from which the view downwards to its base is awfully terrific. The scenery here is wildly romantic; a picturesque wooden bridge over a stream that runs from the foot of the waterfall leads to a banqueting-room commanding a fine view of the glen. The stream in this part of its course is called the Glenistorean, but meeting on the outside of the deer-park with another from Glencree, it takes that name, and after flowing through a succession of richly cultivated demesnes assumes the appellation of the Dargle river on its approach to time celebrated glen of the same name. The entrance to the upper end of this very remarkable glen is about a quarter of a mile from Enniskerry, and to the lower end about two miles from Bray. The glen itself is about a mile in length, enclosed on both sides with towering precipices clothed to their summits with woods of oak, darkening the narrow vale at their base, and occasionally broken by stupendous masses of bare and rugged rock, which rise perpendicularly through the luxuriant foliage. Confined between its rugged bounds, and obstructed in its course by fragments of loosened rocks, the Dargle river rushes through the glen with all the noise and impetuosity of a torrent ; on a ledge of overhanging rock a small Moss House has been placed, affording a limited view of the scenery, which is seen in all its varieties from numerous winding paths commanding in succession its most interesting features. From the Moss House is a path wind ing through the woods up the northern side of the glen, to a projecting platform of shapeless and rugged rock far above the summit of the highest trees on either side, and protruding into the very centre of the chasm ; from this elevated station, which is called the Lovers' Leap, the extent and beauty of the glen are seen in pleasing combination with the softer features of the Powerscourt demesne at its western extremity. From another elevation, at no great distance from the former, called the View Rock, are seen the demesnes of Powerscourt and Tinnehinch, with the lofty mountain of Knocksea ; the splendid chain of mountains from Beehanna to Glencree ; and a large sweep of the glen, with a picturesque cottage on the opposite side. Lord Powerscourt kindly allows public access to the Dargle every day in the week, except Sunday. Kilruddery, the splendid mansion of the Earl of Meath, though in this parish, is so closely connected with the parish of Bray that it is described under that head. Charleville, the beautiful seat of the Earl of Rathdowne, is a handsome modern mansion of granite, erected near the site of a former building, which was accidentally burnt down in 1792 : it is finely situated in a richly wooded demesne of 120 acres, surrounded by the grounds of Powerscourt and embellished with timber of extraordinary growth. Tinnehinch, formerly part of the estate of Lord Powerscourt, is now the seat of James Grattan, Esq., and was the favourite residence of his father, time late Right Hon. Henry Grattan, for whom it was purchased by a vote of the Irish parliament, in testimony of their admiration of his splendid talents and gratitude for his unequalled exertions in obtaining a free trade with Great Britain, in 1782 ; it is beautifully situated close to the Glen of the Dargle, with the woods of which it communicates, and the Dargle river flows through the grounds. The house is a plain building, and previously to the purchase of the estate by the parliamentary grant of #50,000, was the principal inn of the county, and the frequent resort of that distinguished senator, who spent much of his early life amidst these enchanting scenes, in the cultivation of those brilliant talents which commanded the respect and admiration of his country. Bushy Park, the seat of the Hon. Col. Hugh Howard, is beautifully situated on rising ground, commanding an extensive range of mountain scenery, with a fine view of the mansions and demesnes of Powerscourt and Charleville. There are numerous handsome villas in the parish, of which the principal are Lough Bray, in the mountain district of Glencree, a beautiful cottage on the lake in one of the most romantic parts of the mountain scenery ; Ballyornan, the residence of Mrs. Quin ; Dargle Cottage, of R. Sandys, Esq. ; Ornee, of H. Mason Esq. ; Ballymorris, of R. Graydon, Esq. ; Ballywaltrim, of J. Ormsby, Esq. ; Charleville Cottage, of Lady Crofton ; Ballynagee Cottage, of the late Capt. Sandys ; and Newtown Cottage, of G. Kennan, Esq. The scenery of the parish, on the side opposite to that of Powerscourt and the Dargle, abounds with features of impressive character ; the valley of Glencree forms a noble vista, four miles in length, enclosed on each side by barren and rugged mountains, and terminating with the lofty mountains of Kippure, impending over the basin of Lough Bray, below which were the Glencree barracks, a fine range of buildings, erected by Government after the disturbances of 1798, and purchased by Lord Powerscourt in 1834. The scenery around Lough Bray is pleasingly romantic: there are an upper and a lower lake ; the lower, which is the larger, comprises 37 acres, and is near the summit of the mountain, enclosed on one side by lofty and precipitous rocks, and on the other by a steep declivity: this district is much frequented by visiters from Dublin; the approach is by the military road, which joins the road from Rathfarnham. The Djouce mountain, which has an elevation of 2392 feet above time level of the sea, is in the parish, and forms a prominent feature in the numerous varieties of its mountain scenery. The lands not in demesne are chiefly under tillage ; the soil is a light limestone gravel, yielding good crops, and the system of agriculture improved ; turf is procured in abundance on the mountains, and there are several quarries of good granite. The living is a rectory, in the diocese of Dublin, constituting the corps of the prebend of Stagonil in the cathedral of St. Patrick, and in the patronage of the Archbishop: the prebend was instituted in 1303, when it was charged with the payment of #10 per annum to the economy fund of the cathedral: it had formerly two dependent chapels, situated respectively at Kilruddery and Kilcroney ; the latter, in the time of Archbishop Alan, was claimed by the monks of St. Mary's Abbey, near Dublin. In 1831, some townlands of this parish were separated from it by the act of the 7th and 8th of Geo. IV., to form the newly erected parish of Calary. The tithes amount to #369. 4. 7? . : the glebe-house, towards which the late Board of First Fruits contributed a gift of #200 and a loan of #600, was built in 1817 ; the glebe comprises 3? acres, held by lease from the Earl of Rathdown, at a rent of #4. 10. per annum. The church, a handsome modern edifice, nearly in the centre of the parish, and within the Powerscourt demesne, was enlarged in 1820, at an expense of #1000, advanced on loan from the late Board of First Fruits ; the church-yard contains many interesting monumental inscriptions. In the R. C. divisions the parish forms part of the union or district of Bray: the chapel, at Curtlestown, is a plain building, and service is also performed in a barn every Sunday. About 400 children are taught in ten public schools, of which four are supported by Lord and Lady Powerscourt, one by Lord and Lady Rathdowne, and two by the Rev. R. Daly, the rector ; there are also a private school, in which are about 130 children, and two Sunday schools. An estate in the county of Longford was bequeathed by F. Adair, Esq., to the unions of Bray and Delganny and to this parish, one-third each, for charitable purposes. There are ruins of ancient churches at Churchtown and Killegar ; and on a bill to the west of Enniskerry are the remains of a cromlech.